The diagonal jump, or hazama tobi, can be cut; however, one should read carefully what happens when one does so. In this example, White has a good answer at if Black tries to cut, so is not a very good move. 3-4 point low approach, two-space high pincer has an example where this cut is strong. Fan Hui explains in a recent book that this is bad shape for White, taken in isolation. is called the "eye of the elephant". 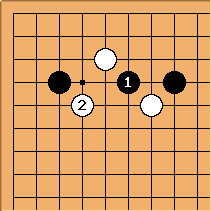 a and b are miai for Black - White has to avoid playing at one of these points as Black takes the other and White's shape suffers. The same holds for c and d.
It's better explained in his book. The section of the book concerning the elephant's eye and other basic shapes is now translated in english: see the section on the elephant's eye at Four basic shapes. xela: I suspect that in amateur games it is often right to play in the middle of a diagonal jump, whereas pros are unlikely to play the diagonal jump if it can be split in this way. This is just my intuition, for what it's worth. Regarding a name change, I have no strong feelings either way (I think of it as a "cut" because if the other player plays at that point it makes a connection; but "splitting" also makes good sense). Malcolm: I think this is a basic shape - almost as fundamental as the empty triangle shape. So, it needs a short name. Why not use Elephant's eye, as Fan Hui does in his book? Cut the diagonal jump, Splitting the diagonal jump, Cutting the diagonal jump could all then be aliases. Bill: The shape term, Elephant's eye, should have its own page. This page is about how to play. Maybe it should be a subpage of the Elephant's eye page. Bill: A GoBase search revealed that, when there are no other stones nearby, the most common response in pro games was tenuki. Malcolm: Yes, that's what Fan Hui explains. Locally, White has no good answer. Bill: I meant that Black tenukis rather than jumping in between, not that White tenukis. Malcolm: I guess that when pros play the diagonal jump, they always check that the elephant's eye move won't be good for their opponent.